I always say that it's important to test in production because nothing compares to a production environment. But it wouldn't be very professional of you to test only—and directly—to production. Testing in production usually gives the impression that you didn't care enough to test before you reached the production stage. But I'd say that in order for you to even dare to test something in production, you need to have run a set of tests previously in a similar environment—including all the data you need for testing. That's where test data management (TDM) comes in. TDM is the process of creating test data that's similar to the real data being used in a production environment. Developers and testers use this non-production data to be more confident that the new software changes aren't going to break anything during the release. A good testing strategy is usually accompanied by testing data taken from production. Developers sometimes use funny, dummy, and non-real data as well. But what are the steps that you need to follow in order to create good TDM data? If you don't know where to go for your next vacation, just book the next flight and start packing. You might have the best experience of your life...or the worst. If you don't know what data you really need for testing, you might just use it all. That approach has pros and cons, so when you test software without having an idea of which scenarios you need to test, you'll want to have an exact copy of the production database because it's the easiest way to start testing with real data. Otherwise, you'll end up spending too much time and money waiting to get your copy of the data for testing. When you start creating your testing process by building the list of test cases you'll need, it becomes pretty obvious how much and what type of data you're going to need. More importantly, think about your testing process as an iterative one. If you start testing the login page, you don't need to have all the information from the user for that test case, such as their birthdate or home address. As you keep iterating, you're going to need more testing data. And as you find more bugs, you're going to need more real data. Unless you need to run stress tests, subsetting data is going to be enough for the majority of the test cases. And even if you still need to validate that the system can handle high waves of traffic, you can also generate varied static data for that purpose. More on this later. Taking small sets of your production database should be enough for most of the tests you'll run to validate the software. You'll also reduce costs and complexity when building only the test data you really need at the moment. We've seen a lot of recent GDP-related lawsuits involving big companies in Europe. 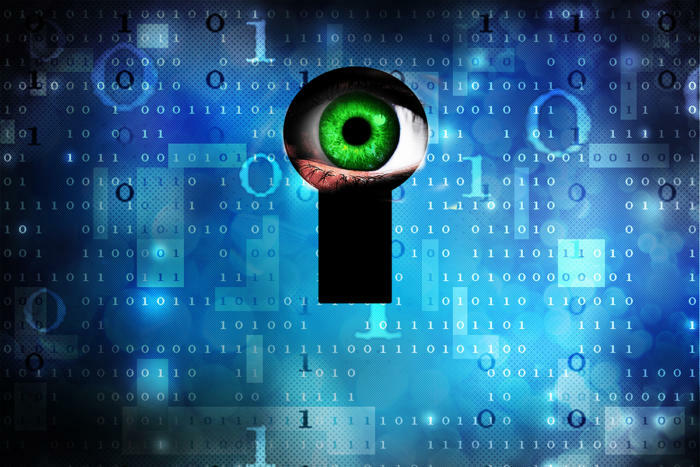 Europe is taking data protection more seriously than other countries. Pretty soon, regulations like GDPR will be implemented on other continents too. If GDPR is already affecting other companies, we better avoid having unprotected sensitive data in our testing environments. SOX compliance regulation fosters a separation of duties within an organization. I've worked with these type of regulations. In my experience, auditors only want to see that only certain people have access to the production environments. These people with privileged permissions are legally responsible for what happens with customer data. Even with regulations in place, data is still leaked. We have to be prepared for that, so you should operate as if you expect the information you're storing will be stolen someday. Mask any data that could identify a person, or what's also called personally identifiable information (PII). Use irreversible methods to mask data so that it's difficult to unmask it. And make sure you're constantly checking that PII is protected. Managing test data will be simpler and easier if you create subsets of the data to fulfill your different testing needs. And you won't have to worry about giving sensitive data to developers or whoever needs production data for testing. Ideally, try to avoid having sensitive data. But since sometimes you can't avoid it, try to keep PII data at a minimum, and securely mask the data you need to have. Even though you decided to mask sensitive data—especially if the data is going to be used for testing purposes—you want to make the security gap as small as possible by not including sensitive data in your tests (even if it's masked). One way to improve security is to replace real data (like credit card numbers) with autogenerated dummy data. That's synthetic data, and it will help you get more efficient results in testing. You can take advantage of the synthetic data approach by using more realistic data than just dummy data. For example, you might have a user called Joe in your records, but for testing purposes, you decided Joe will be called Jeremy. This gives you a chance to run machine learning experiments where you can learn more about "Jeremy's" preferences without knowing that Jeremy is actually Joe. You're protecting Joe, even if the data is leaked or misused. Synthetic data makes real data more shareable because you only have the data you need. Why would you need to know a person's name if you're just trying to replicate a bug in production? You're only interested in knowing which paths through the system's workflow the user took. What matters is why the data ended up in a certain state that caused the software to break. You can then decide either to ignore the person's name or replace it with other "real" data. If you need to have large amounts of data for performance testing, you can use synthetic data to double the size of the database. Along with the previous benefits we discussed, synthetic data makes your tests more efficient by only using the data you need to cover specific test scenarios. DBAs are in charge of generating testing data. They know the best ways to do it and what data is sharable among teams (as I explained in the previous section), and sometimes they're the only ones who have access to production databases. When this happens, the DBAs become a bottleneck, and the time spent in the testing stage increases. That's why you should create test data as a self-service model. It's not just so you don't constantly interrupt DBAs when a developer or tester needs data. The ability to automatically have testing data will let you parallelize the boring task of manually generating data for testing. Do you need to reduce the testing time? Fine. Create more subsets of testing data in parallel and distribute the test cases. Another benefit of having a self-service model is that you can easily drop and re-create environments on demand. By doing this, you ensure repetition and predictable results when preparing testing data. It's also easier to include TDM in your CI/CD pipeline, which brings you closer each day to one-click deployments. Creating a self-service model is far from an easy task. So it's important that DBAs, developers, and testers work together to create this model. Not all of them have the same needs and objectives. Join experience, knowledge, and skill to create a better model for data testing. Last but not least, keep your testing data up to date. Your software will continue evolving, so the test scenarios and the data they need will keep changing over time too. Some test scenarios will become obsolete, and so will their data. Try to always keep the house clean by making sure you're only generating the testing data you really need regarding its relevance in time. This process takes discipline, and good communication within the team always helps. Developers need to inform everyone which tests are no longer needed and when it's OK to remove them. And either DBAs or testers need to keep confirming that the data they're using for tests is still valid and relevant. Keeping data fresh might seem like common sense. But I've seen delivery pipelines where tests continue to grow, even though some of the features no longer exist. Sometimes we get too extreme about trying to have a high percentage of test coverage, which isn't efficient. Having up-to-date testing data will help you have higher quality TDM. I'd say that testing is the most important stage of any software release life cycle. The more quickly you can verify that everything is still working, the better. Always keep the mindset that parallelizing testing will help you to speed up the process. For that, you need to have better test data quality, and it's not always necessary to have an exact replica of what you have in production. In fact, if you don't, it may help you in the cost, security, or speed departments. It's important that you start by defining what you truly need and iterate from that. Automation helps with repetitive and boring tasks, but you need to continue taking account of the human side of things in the equation to generate data for testing purposes. TDM helps you provide only the data you need, on time and securely. "An organization that’s operating at scale can grow to meet greater demand without too much hassle." When it comes to DevOps, it's important to know where organizations generally fall short, but every organization is different. We have to identify where there's waste and what inefficiencies prevent you from delivering software rapidly, consistently, and securely. In this post, we'll cover some keys to DevOps at scale so that you can make your DevOps initiative work in a big organization. People are at the heart of every DevOps initiative. Making sure they're effectively communicating is the first key to scaled DevOps. In big organizations, people are used to delivering software in certain ways. These people aren't known for changing process and technologies often. That's because as a company grows, coordination and communication get more complicated. A key thing then is to change how people work together to deliver software. And I'm not just talking about developers and operations. Marketing, product owners, managers, testing, and especially senior management needs to understand what DevOps means and how their work will be impacted. These people must be engaged in the DevOps journey. You can start by doing workshops to discover waste and inefficiencies. Then you'd define the initial action items for the first sprint of many iterations that you'll need to do to increase efficiency. AWS developed a Cloud Adoption Framework (CAF) to help organizations get on board with the cloud. I happen to find CAF helpful for the things that also have to adopt DevOps. Your team should make the effort to agree on how to better work together. They don't need to be best friends. But when they know each other and understand the needs of other teams, then they can find a balance that works for everyone. Laying the foundation for people to collaborate is the hard part. Luckily, we're about to talk about the easiest problems to solve—technology problems. When an organization is spending too much time fixing and debugging problems and they don't have time to reduce the technical debt, then applying DevOps might add more complexity. Architecture is the next key to DevOps at scale. That's because big companies usually have a ton of interconnected systems where if you try to change something, you might break something else. Tightly coupled architectures need the coordination of many people to release software. Is it possible to do testing without requiring an integrated environment? Is it possible to do releases independently of other systems or services? Decoupled architectures give you the independence to test software without needing to install and configure other parts of the system. Instead, testing is done using mock objects because there's already a contract. Deployments or releases can be done without having to update other applications. You're not breaking any agreed-upon contract, like response formats. It's also going to be possible to release frequently and in small batches—the two essential features of CD or DevOps. The next key to DevOps at scale is to solidify your engineering practices. The first time I heard about how Google runs production systems was when I read the Site Reliability Engineering (SRE) book. I loved how Ben Treynor defined SRE as "what happens when a software engineer is tasked with what used to be called operations." A software engineer gets bored easily. Well, maybe that's true of everyone in tech. But the field that changes constantly is the one for programmers. DevOps actually started as a concept of agile infrastructure, where (predictably) some of the agile principles were applied to infrastructure. As I said before, technology problems are the easiest ones to solve. That's because there are so many tools and practices that were born with the purpose of automating work. In the tools department, we have Jenkins, VSTS, Puppet, Chef, Ansible, Salt, and many more. But more importantly, there are practices like infrastructure as code, production-like environments, canary releases, blue/green deployments, and the most controversial one: trunk-based development. Everything I mentioned there helps you have continuous integration (CI), which in turn allows CD. Deployments can then be a normal day-to-day operation. At that point, there's no difference when releasing a new feature or emergency bug fixes. All changes should pass through the same process, forcing you to decrease deployment time by changing things in small batches. This will make developers happy. You'll improve the mean time to recover (MTTR), and the failure rate for deployments will be lowered, making operations folks happy. The outcomes will please both customers and business owners. The folks heading up DevOps initiatives in big organizations need to have proper tools and practices in place. The next key to DevOps at scale is that developers have access to the code and are responsible for its performance at all times. It's their baby, and they need to keep watch over it. AWS CTO Werner Vogels summed up the idea behind developers being on call when he said, "you build it, you run it." Operations folks usually end up calling developers when there are unknown problems they can't solve. Who better to fix a bug than those that introduced it in the first place? That worked for AWS and Netflix, where developers can push their changes by themselves. But this would be ludicrous at some organizations, especially the big ones. Some companies are under regulations specifying that only certain people have access to production. In this case, having a developer on call is useless because they can't do anything to fix it. So sometimes this becomes more of a mindset than anything else. Developers could have access to a centralized logging tool or other metrics with read-only access. They can have visibility into what's happening. Then developers will tell operations how to fix it. And because they were interrupted in the middle of the night, they'll create something to fix it automatically. Developers will make changes in code to avoid that happening again. Too many times I've seen and experienced that operation folks get tired of reporting the same issues over and over again without any response from developers. Having developers on call makes them aware of issues. This key is related to the first one, about creating culture in the organization. When people are brought together, even if it's forced in cases like this, it makes the team more accountable for their actions. It also fosters continuous improvement, which is essential in every DevOps initiative. DevOps is about shifting things to the left. Change management is one of those things that can be shifted—and doing so is another key to DevOps at scale. Change management is very common in large organizations. They usually have a change advisory board (CAB) that evaluates and approves each change going to production. Most of the time, big organizations think DevOps is not for them because of change management and compliance. They can't automate that process because they're regulated. Jez Humble has a really good talk about the topic. In it, he said he's been involved in some projects for the government, applying continuous delivery principles to highly regulated agencies. that all regulatory controls are in place, making the case for you to include automation for compliance and change management purposes. Auditors actually love this because there's always a trail of every change in the application code that goes live. They can easily see for themselves when changes were approved, who approved them, when they were released, and who released them. This is more effective than sharing screenshots. But it's not just about automation; it's about including those verifications and sign-offs early in the process, when we can pay attention and delay things cheaply. Pair programming or peer-based review is better than having managers reviewing the changes in the CAB meeting. They only evaluate the risk, not what the developers changed. What's better than having a peer changing the code with you? You don't need containers, orchestrators, or microservices to do DevOps. Even if you adopt those new, hot technologies but don't apply everything we just talked about, you've simply wasted time and made things more complex. You can apply DevOps with the people and technology you already have. Process and culture will definitely need to change, and that's usually the hardest part. The technology part is usually the easiest. It's also important that you increase the quality and the amount of feedback. Waste and inefficiencies will always be caught when they're monitored constantly. DevOps is about integrating people, process, and technology. And at scale, things might seem more complicated. You need to find your own way, and your journey might not be the same as others'. But DevOps also works for big organizations—I promise. Related Reading: Pitfalls with DevOps at scale. The sister of IT & Test Environments Management is Release Management, and when it comes to delivering the capability at scale, that is at an organizational level, then we are talking “Enterprise Release Management” (ERM). ERM is the overarching governance framework that brings our different stakeholders, projects and teams together so we can effectively scope, approve, implement and ultimately deploy our changes effectively and in unison. One could say, ERM bridges the gap between corporate strategy and DevOps. However, implementing an ERM framework isn’t necessarily done, as many companies still don’t do it, nor is it necessarily trivial. In fact, there are many barriers to successfully implementing ERM and ultimately ensuring effective and scalable delivery. With that in mind, let's look at a few of the top barriers to ERM success. One of the first steps to successfully implement ERM is to ensure that each stage in the end-to-end pipeline is complete and valid. It's critical that you don't overlook some very important processes in your pipeline like compliance or security assertions. Verifying these types of processes in the software development lifecycle (SDLC) is a barrier in ERM because it is complicated and requires a large number of revisions. When a project starts, the workflow is simple. But as it grows, things get more and more complicated. You need more people, more dependencies, more checks, more systems, and more software changes. Then you need a standard process. Unified practices and processes help organizations ensure that every state is completed properly. Integrating multiple projects and different departments is challenging. Every department has different goals and objectives, so it's not surprising that some departments have conflicts with each other. C-level executives put pressure on managers, who then put pressure on developers, to deliver on time. At the same time, developers pressure IT operators to release software changes faster, but IT ops are responsible for the system's stability and have to consider how every new change might put that stability at risk. This chain creates conflict constantly, sometimes forcing personnel involved in SDLC to break the rules and bypass some processes. As you grow, it will become more difficult to ensure that every stage of the SDLC is completed. Help your teams understand why every piece of the ERM puzzle is important and be clear why some processes can't be left incomplete. A good set of checkmarks (or milestones and gates) will definitely make the verification process less painful. But for that, you need automation, which brings us to the next barrier. The easiest way to start managing portfolio releases is with manual procedures. But having a spreadsheet where you control the priorities and release dates of projects doesn't scale well when you need to integrate more people and projects. Automate every task, process, and documentation you can. Don't think about it—just do it. Breaking the barrier of manually managing releases will let you focus on how to speed up software delivery. Not everything can or should be automated—you still need someone to decide which releases are good to go and when. But getting rid of even some manual procedures is going to change the way you do things in your organization. The process will start by centralizing requests (or registration) for changes, which can come from several sources like marketing, management, and customers. Then you can start recording how these requests move through SDLC. Leaving trails in the end-to-end process helps create status and compliance reports. You can easily leave trails when you integrate automatically—not only teams and projects, but also build, configuration, and deployment tools like Jenkins, Ansible, or Spinnaker. When you integrate tools like these into your ERM, you'll have information on how much time it takes for the company to deliver software change and complete critical tasks and you'll be able to prove to auditors that you're taking care of everything the company needs in order to comply with regulations. Manually managing enterprise releases will give you headaches. People will end up spending too much time on things that don't necessarily add value to the customer. Break this barrier with automation because life is too short to keep doing boring things manually. It's not easy to get the big picture of the release pipeline. There are too many required processes in the enterprise's journey to deliver software changes. And leaving a trail in each stage is the key to increasing visibility. A lack of visibility is a significant barrier to improving the software release process. Knowing where you spend the majority of your time in the release pipeline lets you focus your work efficiently. Maybe you'll find out that you're spending too much time manually configuring applications. In that case, you might need to centralize and automate configuration management. Or maybe you're spending too much time releasing software after it has been approved in a certain environment, like dev. That could be a sign that you're doing deployments differently in each environment. You might need to focus on preparing a good test environment framework. But having more visibility isn't just about improving the process. If management wants updated information about how the project is going, they don't need to interrupt the team. Is the project going to be ready for the agreed release date? In which stage is it currently? Did the software pass all tests? Which team has the hot potato now? All sorts of information tell the story and status of a project, and it's all critical to the success of ERM. And you need to have that information up to date and in real time. Having enough visibility helps the team to communicate and coordinate better. One of the main purposes of the ERM framework is to spend less time on releases. At least, that should be the expectation. The amount of time you spend on releases could become a barrier to succeeding in ERM. ERM is a good framework to plan the date of a release, and that's good to know. But knowing that a release is going to happen in two months doesn't add a ton of value to customers or to management. By that time, it might be too late to release software changes, especially if you need to fix anything after the fact. When you have enough visibility, it becomes obvious where you can reduce the time a release takes. The amount of time between releases can also increase if you fixed a bug that broke something else at the same time. You won't expect to have a high rate of deployment failures when you implement ERM. Needing to coordinate between too many teams, usually in a sequential manner, not in parallel. Waiting to have enough changes to release because it's "less risky." Lacking production-like environments, which help maintain consistency. Hermetically building and packaging the artifacts more than once. Dealing with messy and complex configuration management. ERM should aim to break the pattern of long delays between releases by working to improve software architectures. There are practices like infrastructure as code, configuration management, self-provisioned environment, and others that ERM can orchestrate. Not only does waiting for someone else to finish their part of the job to release a software change cause a lot of problems, but it could also become a barrier to ERM's success. You could end up accumulating too many changes, which, as we just discussed, increases the risk of failure and the time between releases. What should the team that's waiting do? Keep waiting? I don't think so—they usually start working on something else, which means they could be interrupted constantly to help with the pending release. Let me give you an example of a common scenario. The developers have just finished their code changes to use a new column from a table in the database. Now they need to wait for the DBAs to add the new column, and after that, the code is ready for the release. Seems like a decent system, right? Wrong. That's just a sign that the architecture is highly dependent on the database. Developers should be able to release software without having to worry that any dependency—like the database—has everything the application needs. What if database changes take a while to be ready for the release? No problem; the application code is using feature flags, and it's just a matter of releasing the code with the feature turned off. What if the database changes have problems after the release? No problem; the application is resilient enough to expect problems in the database. Now that's a way of working that doesn't need complex solutions. Code apps so that they're ready for a release at all times. If you miss the train on a release, you need to wait for the next one to come, and that should be OK. It's better to wait to release something until you are sure that it won't have a negative impact on the company's revenue. But as soon as it's ready, ship it. As you can see, not all the barriers I described are related to a specific stage of deployment. Many teams play significant roles in the success of ERM, beginning when a project is planned in management offices to when it's being delivered to end users. Automation; traceability; versioning control; decoupling architectures; releasing small, frequent changes; and other DevOps and Agile practices are going to help you successfully implement ERM. But also having the proper tools in place are key. Because if you only have a hammer, everything looks like a nail. 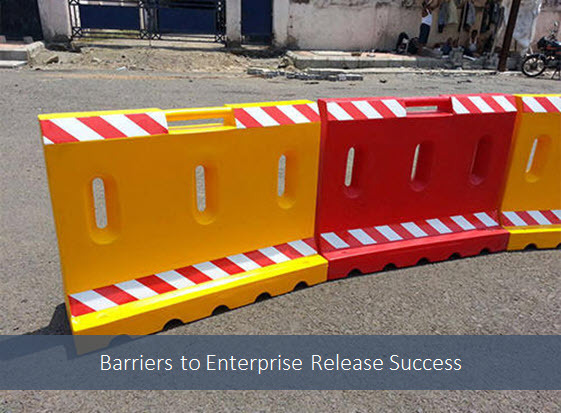 Barriers to a successful enterprise release management will always exist. But as long as you continue to find opportunities to improve, success is practically guaranteed. Contribution by Christian. Christian Meléndez is a technologist that started as a software developer and has more recently become a cloud architect focused on implementing continuous delivery pipelines with applications in several flavors, including .NET, Node.js, and Java, often using Docker containers. After years in obscurity it appears that IT & Test Environment Management tools are now starting to get noticed. This year saw several IT Environment Management products being nominated by CIOReview as the most promising DevOps tools. Most probably in recognition of the importance of managing your IT Environment & Operations to achieve "DevOps at Scale" and ultimately better manage you cloud landscape. Congratulations to the winners Enov8 and the other CIO Review Top 20. 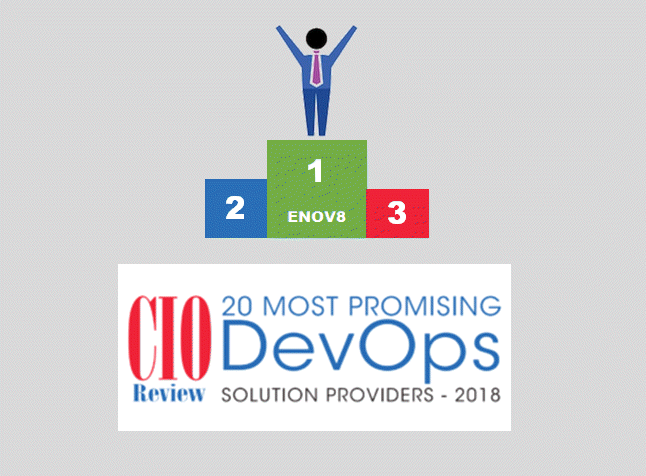 Enov8, the Enterprise IT Intelligence company, has been named winner of this year’s, 2018, CIOReview “20 Most Promising DevOps Solution Providers”. SYDNEY, NSW, AUSTRALIA, July 17, 2018 /EINPresswire.com/ -- Enov8, the Enterprise IT Intelligence company, from Sydney Australia, has been named winner of this year’s, 2018, CIOReview “20 Most Promising DevOps Solution Providers”. A somewhat unique winner, Enov8 goes “against the grain” of providing a “simple” DevOps point solution, and provides a broader “business intelligence” platform that helps organizations run their Enterprise DevOps more effectively through the embracement of methods that help the organization better understand and manage their complex IT landscape and delivery chain operations. Note: This award follows some of Enov8’s recent achievements which include various big wins with global enterprises (banking, telecom and retail) and significant partnership announcements with some of the world’s largest technology service provider. Enov8 is a leading “Enterprise IT Intelligence” and “Enterprise DevOps” innovator, with solutions that support IT & Test Environment Management, Release Management and Data Management. Enov8’s philosophy is to help organizations be “Agile at Scale” through enhanced transparency and control of their IT landscape and operations. CIOReview is a leading technology magazine that has been at the forefront of guiding organizations through the continuously disruptive landscape and providing enterprise solutions to redefine the business goals of enterprises tomorrow. Recognized as a principal and reliable source of information, CIOReview offers a ground-breaking platform allowing decision makers to share their insights, which in turn provides entrepreneurs with analysis on information technology trends and the broader environment.